The first Fallout 76 beta session went up yesterday for a short four-hour stress test, but some last-minute woes left a lot of players unable to play it. To make up for these issues, Bethesda have announced that they’ll be holding a longer Fallout 76 beta tomorrow, Thursday November 1. The second beta session will now run four hours longer than previously announced, so Fallout 76 will now be online to play for nine hours altogether. It will be available tomorrow from 11:00 PT / 14:00 ET / 18:00 GMT to 20:00 PT / 23:00 ET / 03:00 GMT (Friday morning, November 2). Last night’s first Fallout 76 beta stress test did not run at all smoothly for PC players. Despite the Bethesda.net Launcher allowing for a preload earlier on in the week – which many users took advantage of – just hours before the beta session went live, the launcher was hit by a bug that deleted the entire 48Gb preload. 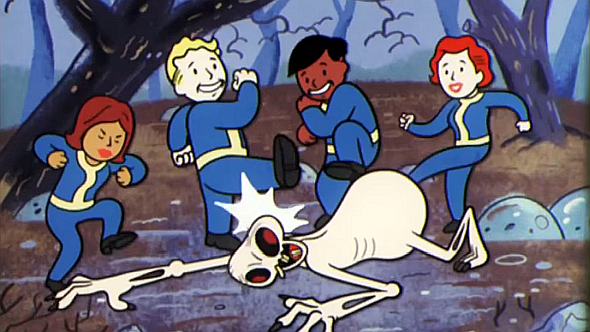 Bethesda tried to warn people, but any unaware players who clicked any part of the launcher were forced to re-download the entire Fallout 76 beta again. Whoops. For many players, including ourselves, that meant missing out on a huge chunk of the first Fallout 76 beta session – which was already rather unreasonable for UK players in the first place, since it ran from 11pm to 3am GMT. Bethesda’s only solution for users was, “if you see a progress bar, please allow the download to complete,” which wasn’t massively helpful. Still, the publisher are aware that they screwed up, and are offering the extended beta session tomorrow in order to “make good” with players. There are a further two beta sessions planned for this weekend, November 3 and November 4, which will all start a little earlier than Monday’s session. Fallout 76 itself will launch on November 14. Hopefully any problems with the Bethesda.net Launcher will be sorted out by then, and it won’t randomly delete the game again.